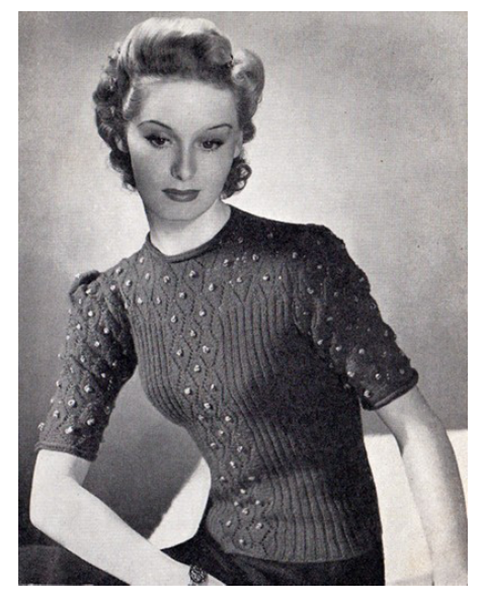 Yesterday, I started knitting the 1940's Bobble Jumper. I actually started it last week, while working the overnight shift. However, at 2 am with American Horror Story to distract and freak me out, I really couldn't pay attention to knitting. I got a few inches of it done yesterday and the lace pattern is actually working out pretty well! I am always worried when I start a new pattern with stitches that I don't know how to do- will it turn out? Thank goodness for You Tube and all of the wonderful knitting websites out there, teaching me to knit as I go along. My sweater is a fluffy white and I think I will add the colored knots in green...maybe blue....maybe red....I don't know! Speaking of knits, check out the drool-worthy knit pics that Lisa from Snoodlebug posted this morning. Looks really cute, one of these days I'm going to take up knitting. How exciting! I love how the return (or promise of return - we're still getting surprisingly nice weather for this time of the year here) of autumn ushers in more time (and, one might argue, even desire) for crafty projects of all kinds. Wishing you tons of success with your new sweater - can't wait to see the finished project! It's always fun to start a new knitting project! I've got to finish up one that I started last fall before I dive into anything new though ;) And I agree that YouTube is wonderful - it saved so many of my projects. Ooh, I'll have to bookmark this baby as it doesn't have the ubiquitous 4 inches of K1,P1 along the bottom :-) Looking good already! 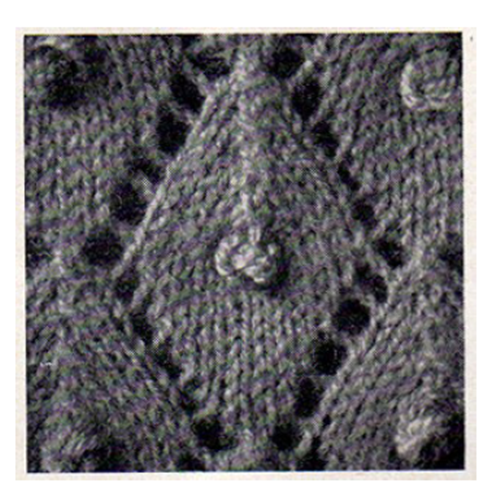 Oh I have been dreaming about that very pattern since I saw it on vintage purls ages ago, I've so far not been brave enough to start it, Yours is looking fabulous already, I can't wait to see it when is finished! Love this piece. 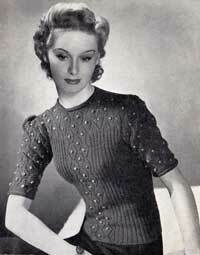 I actually knitted this many, many, many years ago when it was post war style in the 1970s. LOL It has a lovely fit. This looks like a beautiful start. Good luck!